In the face of so much full-frame camera chatter the latest mid-level Fuji camera has a lot of weight on its shoulders. But it needn't worry: if you're looking for something that's stylish and capable then the X-T30 is with little compare in 2019, featuring the quality and many of the features of its X-T3 bigger brother - but for a cut of the price. It's been a rollercoaster ride throughout 2018 and into 2019 as camera brands push into the full-frame mirrorless market (there's been the Panasonic S1, Nikon Z7, and Canon EOS R all joining the fray). But, you know what, that's now where the bulk of interest lies. Not everyone wants a massive sensor, a massive camera body as a result, nor any of the consequential expense that comes with it all. 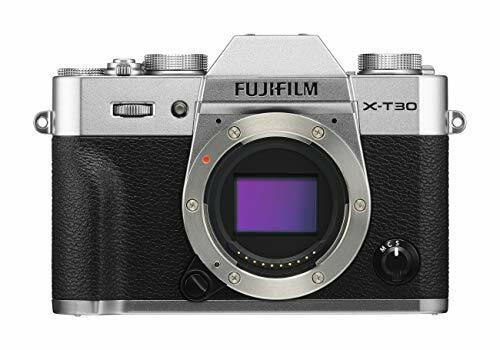 Fujifilm has long been a purveyor of the crop sensor market, delivering retro-styled X-series cameras for many years. It does a darn good job too: the X-T3 showing off what's possible, much of which trickles down into the even smaller X-T30, as previewed here. As the update to 2017's X-T20, what does the X-T30 bring to the party in this now full-frame tempting world. Is it the APS-C mirrorless camera to consider? What's new: X-T30 vs X-T20? On the face of it the X-T30 looks identical to the X-T20. Well, from the front, if you ignore the new badge anyway. Flip this baby around, however, and the latest model has had an overhaul: the d-pad is gone, replaced by a more practical joystick; the Q button (that's for quick menu access) is displaced as a result, now prominent on its own sticking-out nub. There's more going on behind that scenes (that we'll get to in more detail later in this review). The X-T30 has the same sensor as found in the X-T3, meaning it's both higher-resolution and more sensitive than its predecessors (it's back-side illuminated, so can function with lenses of much wider apertures - potentially useful when an f/1.0 lens arrives at some point in the future). Elsewhere tweaks to autofocus see improvements in tracking, while the viewfinder has been made a little brighter than before. Oh, and it's now USB-C charging, so there's no separate cradle for battery charging included - it's all done within the camera (at three hours, adding 30 minutes over the older process). We find the new design makes for a better user experience too, largely thanks to that joystick control. It makes moving, say, the focus point that much swifter than using the d-pad used to be. However, it can be a little fiddly at times - because it acts as a depressible button, sometimes pressing it down will result in some unwanted movement, so there's some fine-tuning to be done there for future generations. Not that you have to use the joystick for autofocus adjustment. The X-T30 has touchscreen controls too, which have supposedly been improved over the X-T20 in terms of responsiveness. We feel it's responsive, but not smartphone smart just yet. And when a face presses against the screen - say your nose or whatever when using the viewfinder - that can sometimes inadvertently move the focus point too. The screen is well appointed, just as that found on the X-T20 was. The dual-axis bracket is handy, although we'd prefer a proper side-bracketed vari-angle design for greater versatility. That said, the X-T3 has a screen that can be adjusted in all manner of directions, so if you want that then you'll just have to pay the extra cash to buy the step-up model and its advancements as a result. The bigger adjustment for the X-T30 over the X-T20 is in the viewfinder. Sure, the panel is the same 2.36m-dot one as before, but it's now brighter and smoother than before, thanks to a 100fps refresh rate and 800nits brightness. The numbers aren't what's really important here: it's how it acts when against your eye (assuming set to Boost mode for the max refresh, otherwise its less) in delivering sharp, clean and smooth images without ghosting in lower-light conditions. There are bigger finders out there, but for the price point this is a great solution. How does the X-T30 perform? So here's one of the X-T30's biggest selling points: it acts much like its pricier bigger brother, the X-T3. That's because it has the same fourth-gen sensor, with millions of on-sensor phase-detection pixels used for autofocus. They cover the sensor from edge to edge, giving great autofocus right across the breadth, with focus acquisition down to -3EV for low-light shooting. As we said of the X-T3, however, this low-light shooting figure isn't foolproof. The X-T30 is largely effective, but inside a dim-lit London club we were struggling to get the camera to lock onto middling contrast subjects when the focus area was set particularly small. In auto, or with a larger focus point selected, the camera is more adept at locking onto subjects in the dark. It's certainly better overall than the X-T2 and X-T20, but it's that pinpoint finery that still needs improvement - something that Panasonic has mastered beyond any other. We say the X-T30 acts much like its X-T3 cousin, but in some respects it functions better. Yes, you read that correctly. This is because the X-T30 comes with 'Gen 4.1' autofocus, which adds in tracking and eye-detection improvements over its X-T3 bigger brother - improvements that will be coming to that camera in mid-April, so nobody misses out. The eye-detection box is now smoother in motion, harder to interfere with by passing objects and when Eye AF only is selected you'll not have a full face detection box activated too. However, the eye-detection autofocus can be confused. If you leave it active then it might find eyes/faces in, say, tree canopies - and then it'll override your focus preference, which can be irritating. Therefore we'd advise placing the Eye AF function onto a function button (Fn) control, to make toggling it off and on nice and easy. There's quite a lot of menu digging required to make that happen - which we think could be simplified to make it more accessible. Where the X-T30 isn't as adept as its X-T3 brother is with its buffer and burst shooting capabilities. The X-T30 is still capable of 30fps with the electronic shutter and up to 8fps with the mechanical shutter, which is pretty good going indeed, but the buffer capacity is around half that of the X-T3 so you won't be able to whirr off quite as many shots in one. Again, we don't see that as a problem, more a choice: you can pay the extra and get the X-T3 if you please. Both X-T3 and X-T30 feature a variety of scenario-based autofocus options though (screengrabs in the gallery above) to let the camera know the subject behaviour for the optimum autofocus adjustment. It works really well, as we'd seen with the X-T3. What's the X-T30's image quality like? Having spent about 45 minutes with the camera taking some snaps, we can't offer a definitive verdict on what the image quality will be like. After all, it's largely lens dependent and we were only shooting with the 18-55mm kit lens (which, as kit lenses go, is pretty decent, includes an aperture ring and is silent to focus). What we can say is that the X-T30 has the same sensor as you'll find in the X-T3. There's no difference, therefore, in the potential of image quality with the right lenses on the front of the more affordable camera. In the future there'll be some great possible benefits as a result of the back-side illuminated sensor at the X-T30's core. The wide incidence that the X-Trans CMOS 4 sensor can receive light makes it f/1.0-ready, Fujifilm says, which isn't a surprise as the company has a 33mm f/1.0 prime lens in the works. Even without that lens in existence yet, the expanded range of Fujifilm's optics means there's something for more or less every situation. It's in good lighting conditions where results really shine though. The ISO 160 baseline sensitivity still isn't a low as we'd like, but there's an extended ISO 80 option to help keep that aperture wide open as needed when the sun is out. Dim conditions are well handled too, thanks to the sensor's construction, with four-figure ISO sensitivities delivering plenty of detail. Just don't overdo it: there's an extended ISO 51,200 option that, well, isn't especially useful - you'll see image noise present all over the place - but, saying that, the quality is on par with many cameras despite the ability to shoot in lower light conditions by around eight fold. We've always praised Fujifilm for its image quality prowess. And the X-T30, like the X-T3, is well on point here. No, it's not full-frame like so many new-found competitors, but pop the right wide-aperture lens on the front and you won't mind one jot. Especially from something so small, light, well designed and great-looking as this. In the face of so much full-frame camera chatter - the Canon EOS RP was announced just one hour prior to the X-T30's unveiling, highlighting this very point - the latest mid-level Fuji camera has a lot of weight on its shoulders. But it needn't worry: if you're looking for something that's stylish and capable then the X-T30 is with little compare (we've always spoken highly of the Panasonic G80 - but that's about three years old now and likely due a replacement). Our minor moans are few and far between: the single point autofocus, when set to small, could be finer in its response (especially in low-light conditions); some competitors will operate to -5EV or -6EV and, therefore, are better low-light performers; and the eye-tracking focus should be easier to disengage. But as the X-T3 had already proven - and the X-T30 takes the reins in this regard - you can get exceptional autofocus ability, including for moving subjects (the eye-tracking is a solid feature indeed), with great image quality from a small package, and all at a reasonable price point. There's very little missing from the X-T30 indeed. It's retro done right once more. The Fujifilm X-T30 will launch on 20 March 2019, priced £849 body-only, £899 with the 15-45mm kit lens, £1199 with the 18-55mm kit lens. A charcoal silver model will follow in May 2019, with the same pricing structure. A new 16mm f/2.8 R WR lens will also launch, priced £349.